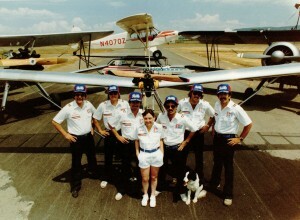 Great American Flying Circus-crew photo. Bill Warren, Ronn Dilling, Johnny, Suzi, George DeMartini, ?, and Brian Lansburgh. Jessie is laying in front. 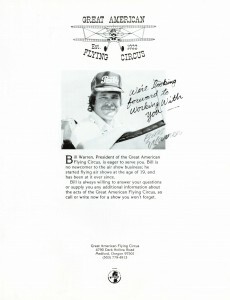 Great American Flying Circus folder. Bill Warren’s picture and short information – back. 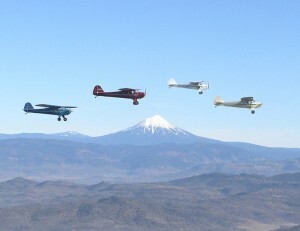 Four Taylorcrafts in flight, passing near Mt McLoughlin in Southern Oregon. 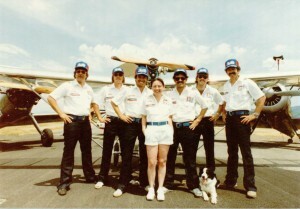 Pilots (left to right) are Gene Warner, Brent Conner & Stefanie Conner Huber, Bill Warren, and Lyn Cate.